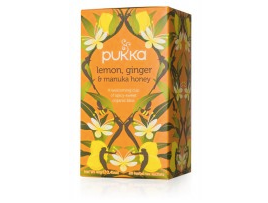 Cozy up to Fall with 10 Picks from our Pukka Tea Patch! As the days become shorter and the nights grow colder, the foraging for our cozy comforts begin. 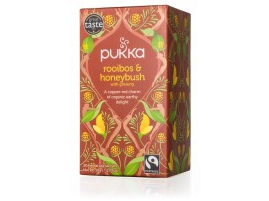 While our attempts to stay snug and dry are often challenged this time of year, we can find solace in a warm, welcoming cup of tea._x000D_ _x000D_ We have carefully selected the coziest flavours from our new organic Pukka Tea range that will love you from the inside out._x000D_ _x000D_ _x000D_ _x000D_ _x000D_ _x000D_ _x000D_ _x000D_ Elegant English Breakfast_x000D_ _x000D_ Start the day the English way, unhurried and elegant. These fairly-traded, hand-picked, Vietnamese whole Nam Lanh leaves need time to breath, so take your time in the morning and let it brew while you carry out the rest of your morning routine. With a splash of heat, these leaves will come to life for you and make you feel alert and ready to take on the day ahead._x000D_ _x000D_ _x000D_ _x000D_ _x000D_ _x000D_ _x000D_ _x000D_ Ginseng Matcha Green_x000D_ _x000D_ This organic whole leaf Sencha green tea with the zip of lemongrass, ginger and pure red ginseng will lift you from your slumber, even on the darkest of mornings. 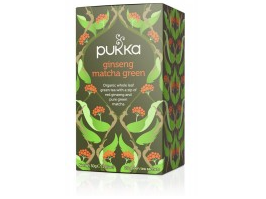 Pukka has supercharged their green tea with matcha powder, grown on an organic farm on a beautiful volcanic island off the coast of South Korea called Jejo Du .The Korean name for their matcha is, Jejo do Garucha, which literally translates as ‘Jeju Island Powder Tea’. The power of organic pure emerald matcha powder combined with Ginseng will improve mental clarity, physical performance and increase stamina. It’s the perfect brew for our over-stimulated busy world._x000D_ _x000D_ _x000D_ _x000D_ _x000D_ _x000D_ _x000D_ _x000D_ Rooibos Honeybush_x000D_ _x000D_ Formerly known as morning time, this vibrant copper-red roisboos tea combined with the golden yellow of honeybush will wake you up feeling like a fall fashionista. Red teas in particular are full of minerals including calcium, potassium, magnesium, zinc, copper, sodium, iron and mangonese and due to the lower level of tannins, (compared to other teas) which inhibit mineral absorption, they encourage mineral absorption. It’s a delicious caffeine-free alternative for your morning ritual . Interestingly, there is only one place in the world where this plant grows naturally and this is in the Cedarberg region of north-west Cape Town. The traditional method of harvesting this plant, involved the leaves being bruised with hammers and then being left in heaps to dry and ferment in the African sun to develop its characteristically amber-red colour and sweet, fragrant taste._x000D_ _x000D_ _x000D_ _x000D_ _x000D_ _x000D_ _x000D_ _x000D_ _x000D_ _x000D_ Elderberry & Echinacea_x000D_ _x000D_ With a drop in temperature and the relentless soggy weather, many of us become vulnerable to the cold and flu season. 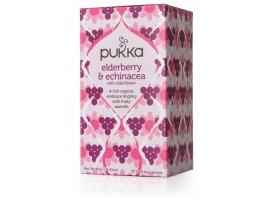 The Elderberry and Echinacea combination stimulates the body's defense mechanisms, and when used together, results in a more potent immune system booster than when used separately. If you feel the presence of bug lurking in the mist, let yourself fall into a deep bed of ripe wild fall fruits: purple-black elderberries, inky blackcurrants – blessed by the fragrant Wild elderflower and touched by the tingling notes of echinacea. Safe in your fruity refuge, you’ll be ready for anything._x000D_ _x000D_ _x000D_ _x000D_ _x000D_ _x000D_ _x000D_ _x000D_ Lemon Ginger & Manuka Honey_x000D_ _x000D_ Lemon, Ginger and honey; These three musketeers are warming up, ready to soothe your sore, tired throat. This famous combination is a rejuvenating cup of pure nourishment, with Vitamin C, anti inflammatory and antibacterial properties to bring you back to life. So settle down and take comfort in the spicy-sweet zest of sun-ripe whole Sicilian lemons and slow-dried ginger root with Wild elderflowers, finished with the velvet kiss of manuka honey. This truly is, a hug in a mug at a time when you most need it!_x000D_ _x000D_ _x000D_ _x000D_ _x000D_ _x000D_ _x000D_ _x000D_ _x000D_ _x000D_ Star Anise & Cinnamon_x000D_ _x000D_ With a cup of magic in your hands, anything is possible. The spices in this blend have anti-microbial, anti-bacterial and anti-fungal elements which serve to protect the body from ailments and improve your general well-being. Add a douse of warm water to awaken the celestial star anise, then feel its organic sweetness and heavenly warmth hearten your soul, whilst the silky spice of ginger and cinnamon tingle your spirit._x000D_ _x000D_ _x000D_ _x000D_ _x000D_ _x000D_ _x000D_ _x000D_ _x000D_ _x000D_ Gorgeous Earl Grey_x000D_ _x000D_ An enchanting, fragrant fusion from India’s most ancient tea gardens, these leaves have absorbed the wisdom of the ages. If it’s 3pm and you’re feeling the weight of your day with 2 hours still to go, take a moment to sip and savour the refreshing brilliance of bergamot for its natural calming aromatherapy qualities. Together with a delicate lift of lavender, it will boost your mood and put you back on track, minus the stress. Instead of reaching for the sweet afternoon sugar high that will leave you crashing back to earth in a matter of minutes, pour a cup of Earl and add a touch of lemon to boost the natural citrus extract present in this gorgeous tea, your cravings will quickly cease. _x000D_ _x000D_ _x000D_ _x000D_ _x000D_ _x000D_ _x000D_ _x000D_ Peppermint & Licorice_x000D_ _x000D_ If the sugar cravings keep haunting you this Halloween, this Peppermint Licorice Tea will give you all the goosebumps you need, but you don’t have to be afraid. Licorice contains a natural sweetener, glycyrrhizin, which is 50 times as sweet as sucrose and is host to many medicinal properties associated with the digestive tract and indigestion. 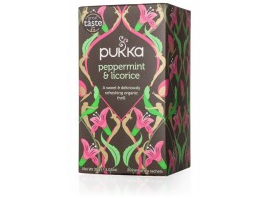 Then you have the refreshing addition of peppermint which helps to relax intestinal muscles and relieve gas and bloating. And who doesn’t love peppermint flavors, especially around the holidays? Replace the candies in your desk draw with a couple of Peppermint Licorice tea bags, we dare you!_x000D_ _x000D_ _x000D_ _x000D_ _x000D_ _x000D_ _x000D_ _x000D_ After Dinner_x000D_ _x000D_ Just like a bear preparing for hibernation, we tend to stock up on our food supplies and consume a little more in the colder months to keep ourselves warm and maintain our energy levels. And if keeping warm and awake isn't an excuse to eat a little more, the fall festivities will be! 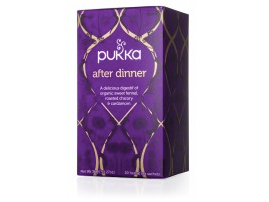 With Thanksgiving and Halloween in the same month, your digestive system may be feeling a little under the weather so Pukka’s aromatic After Dinner tea is here to help! The main characters in this blend are Chicory root and Cardamom. Chicory root supports digestion and the breakdown of fats by increasing bile production. It also contains inulin which is food (a.k.a. prebiotic, a soluble fiber that people cannot digest) for beneficial digestive flora. Cardamom ​can be used in much the same way to counteract digestive problems. 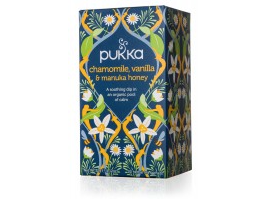 This spice also helps the body eliminate waste through the kidneys._x000D_ _x000D_ _x000D_ _x000D_ _x000D_ _x000D_ _x000D_ _x000D_ Chamomile Vanilla & Manuka Honey_x000D_ _x000D_ It's a cup that invites stillness so you are restored. Drinking chamomile tea soothes the nervous system so that you can relax and in return, sleep better. It’s the perfect nightcap. It has been used as a solution for insomnia for centuries and a recent study has also found that consuming chamomile tea can increase urinary levels of glycine, an amino acid that has been shown to relieve muscle spasms. With the addition of velvety vanilla and golden balm of manuka honey, it is bound to send you off into the sweetest of dreams. 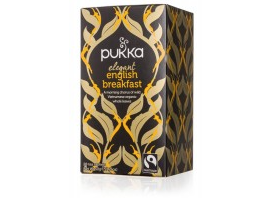 _x000D_ _x000D_ You can discover more delicious blends from the Pukka Tea family here.